Last night, on the heels of a mild fall, winter finally blew in from the prairie to the west and covered Gustavus Adolphus College in snow. Just this weekend, the College celebrated its 45th Christmas in Christ Chapel, the annual signature event that brings over 5,000 guests to campus and is livestreamed to audiences across the nation and around the globe. Christmas in Christ Chapel is one of the crown jewels of tradition at Gustavus, and its planning and execution touches every corner of the campus community. But after the lights come down and the echoes of O Come, All Ye Faithful stop ringing from the concrete and quartz walls, another holiday tradition fills Christ Chapel — the annual Winds of Christmas service. Winds of Christmas is beautiful in its simplicity. Held during the Daily Sabbath service at 10 a.m., the concert is a chance for the campus community to come together on an ordinary weekday to celebrate the beginning of the Christmas season. During the service the Gustavus Wind Orchestra and Gustavus Wind Symphony, conducted by James Patrick Miller, Karrin Meffert-Nelson, and Heidi Johanna Miller, play a medley of Christmas carols, Greensleeves, and finish with the crowd-pleasing Sleigh Ride. It gets cold up here in the winter, and visitors to today’s concert were faced with slippery sidewalks and a cutting wind that drove snow across the campus. And yet, for 20 short minutes, there was nothing but warmth in Christ Chapel. There was no worry about the stress of writing papers or studying for finals, no looking ahead to today’s class or the next meeting. 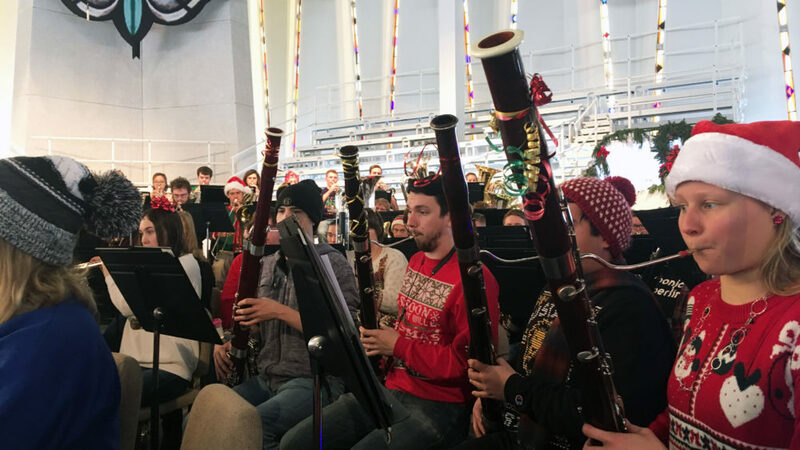 The band wore holiday sweaters and adorned their instruments with ribbons of red and green. The conductors wore necklaces with flashing bulbs. And the audience — students and professors and custodians and administrators and retirees — came together to share the joy of the Christmas season. And while the band played Greensleeves, the sun broke the clouds, glinted off the blowing snow, and shined through the stained glass of Christ Chapel. The light danced on the community and it was Christmastime on the hill.